-Please do not dissemble the product. -The hair clipper can not be washed. Please keep it away from wet conditions. -The product can only be cleaned by cloth with little water or mild soap solution. -Do not charge the product under environment above 40 degrees or below 0 degree. -The product can produce little heat during using or charging, whice is normal. 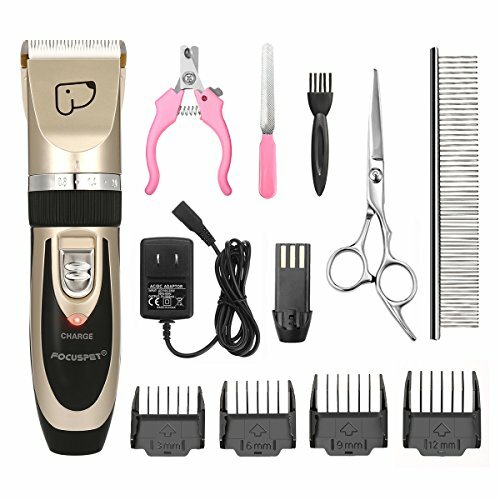 ★ALL-IN -ONE: This pet grooming kit come with 10 kinds of tools: 1× Pet clipper (including a rechargeable battery),1× AC Power Adapter,1× Cleaning Brush, 4× Comb Attachments (3-6-9-12mm),1× Stainless Steel Scissor,1 × Nail Clipper Kit,1 × Nail File,1× Stainless Steel Comb. Pet clippers fit for All HAIRY PETS! Due to the shipping restrictions, the package does not include oil. ★LOW VIBRATION AND LOW NOISE:Pet clippers for dogs with Precision motor, low vibration and ultra quiet design, free it from work noise with only about 60 db, to help the pet feel at ease, not afraid haircut any more. Powerful motor of professional dog clippers (the spindle of which is made of fine copper), not to clamp and hurt pet hair. ★CORDLESS and RECHARGEABLE: Light weight and cordless design for easy use. The pet grooming kit is equipped with a charger. Charging for five hours, pet grooming clippers can sustain uses of 70 minutes. With the cordless clipper, you can no longer be bothered by the trouble of replacing batteries or boring wires.but also available for cord. ★SATISFACTION GUARANTEE: For 1 year after the date of purchase, we take care of all quality-related issues with a REPLACEMENT or FULL REFUND. If you have any questions about this product by FOCUSPET, contact us by completing and submitting the form below. If you are looking for a specif part number, please include it with your message.